Do you know when your MOT is next due? 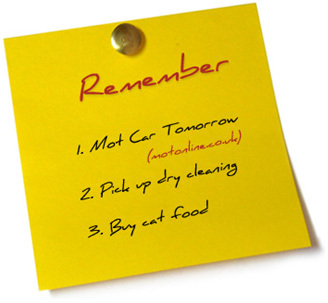 Around 13.8 million (41%) British Motorists say that they often struggle to remember their cars MOT expiry date. Well you're not the only one, according to a Kwik-Fit survey Motorists keep missing MOTs. Our new service will remind you of your MOT expiry date 1 Month before your MOT expires on your vehicle. The service is completely FREE of charge. You can add additional vehicles with our MOT reminder service allowing you to keep a record of expiry dates and to receive a reminder on all your and your families vehicles. It takes 1 minute to register and we promise not to pass your information to any 3rd party companies. Remember you can be fined up to £1000 and have your vehicle crushed if you don't have a valid MOT certificate on your vehicle.